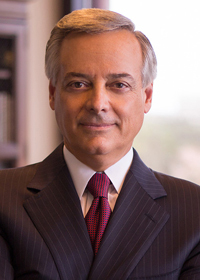 Michael Mitrione is a shareholder who currently serves as co-chair of Gunster's corporate law practice and as part of the firm's banking law practice. He joined the firm in 1979, after practicing in New York City for four years. He has served as the chair of Gunster's corporate law practice for more than two decades, as well as served on the firm's board of directors. Mike routinely advises clients on a wide variety of business, corporate, securities and banking law matters. Mike strives to bring a value-oriented, practical, problem-solving approach to all matters. He has represented companies and investors in a wide variety of industries and at all stages of growth, from private start-up ventures to large public companies. Mike provides strategic counseling for and advises U.S. and foreign-based entities and their directors and officers on mergers and acquisitions, equity and debt financings, corporate governance and joint ventures. Mike also advises clients on corporate structuring and restructuring; employment, compensation and non-compete arrangements; securities and banking regulatory compliance; and licensing, distribution, sports and other business agreements. Mike has received recognition from numerous industry publications, including The Best Lawyers in America®, Chambers USA, Super Lawyers, Florida Trend and the South Florida Business Journal.